Gerry Anderson is a name forever burned into the minds of kids who grew up with sci-fi series like Fireball XL5, Captain Scarlet, Stingray and of course, Thunderbirds - but with a little help from crowdfunding, we might get to see a new Anderson-created Puppet series hit screens called Firestorm. You might have heard about Firestorm before, as Anderson's concept (which saw a 23rd century international Anti-terrorist organisation do battle across the globe against rising threat Black Orchid), first pitched in 2001, was actually picked up by Enoki Films and made into a short-run Anime back in 2003. 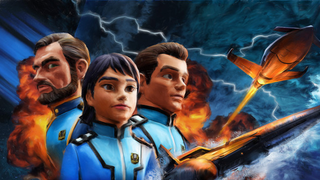 The anime didn't really catch on in Japan, but now Anderson's son Jamie wants to go back to his father's original series bible for the show and recreate it as a Puppet series akin to his previous series - filmed in 'Ultramarionation', an evolution of, and homage to Gerry Anderson's 'Supermarionation' puppetry filming techniques. The kickstarter, which launched today, is asking for £49,280 - enough to film a minisode pilot for Firestorm that would run for around 8 minutes or so. Stretch goals include the potential to bump up the pilot to a traditional 22 minute long (which would cost a whopping £135,000!) episode, or even up to a 45 minute feature if the kickstarter hits high enough (£342,000). It apparently costs a lot to put together a practical show like this these days. If you're interested in backing the project, you can do so at the link below.